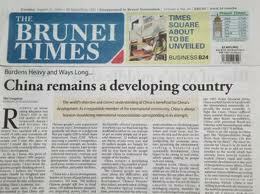 rocky's bru: Brunei has freest Press in Asean? Click to read more Press Freedom Index: Does It Matter? Reporters Without Bothers. Some journalist friends who have worked in Brunei and who are still there were floored when I told them that, according to the Reporters Without Borders or Reporters Sans Frontiers' (RSF), Brunei had the most free press in Southeast Asia today. It is a "fact" that must be especially hard to accept for the journalists from Indonesia, some of whom believe they are God's gift to press freedom in this region and the Muslim world at large, and also those from the Philippines, who have been reporting without fear or favour for as long as anyone has cared to remember! And we all thought that for Asia, India had established herself as equal if not better than the West when it comes to press freedom and other liberties! Well, according to the RSF, we aren't that far off from India, actually! I told Malaysiakini (the BM section: Senarai Kebebasan Akhbar dibuat tanpa "kerja rumah" teliti) when they called me for my comments yesterday that I thought the Reporters Without Borders did not bother at all to do proper homework. Those dudes should come here to KL and share with us whatever it is they're smoking ... [click here if you can't access the article above]. Press freedom in Malaysia that Rocky is so proud? How about a survey ..how many papers are owned by the government ....in each country....and on corruptions...which position Malaysia is slotted into? 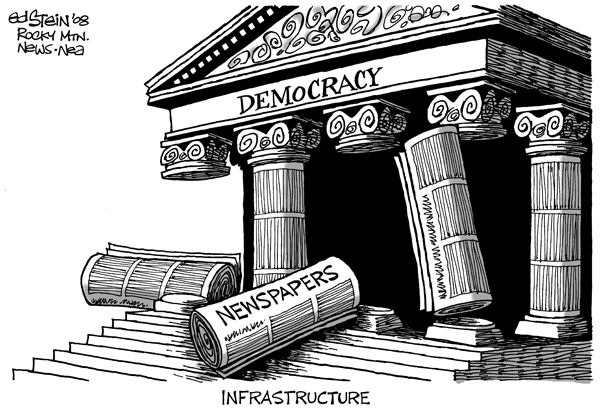 The answer is government does not own any newspaper. Can't tell for political party though. As for survey, the position is 7. Could have been better but for corrupt activities in Penang, Selangor and Kelantan. One thing is clear as crystal. Want to be proud of Malaysia? 2. Issue TV license to opposition. 3. Debate with Anwar lah... Have balls, don't hide underneath the tempurung. access time in radio and TV during election. Latuk, everything fair right? Apa macam, boleh support kah, Latuk Locky? Malaysian govt controlled media Nst Star TV3 are all useless. No courage to report without fear or favour. 30Why no post on your Sifu Mahathir accusing Anwar has a hand in the Sabah's frauds voters??? He finally admitting there are Indons & Philipinos made citizens overnight.....and said Tunku did the same thing too. Now he accused Anwar have a hand in it. He started talking about Sabah's phantom voters..when witnesses keep pointing figures at him.....admitting and the start of his usual blame game. hoi ROCKY!! This is very important to know the real truth la. Reporters Without Borders is a Soros-backed organisation, so no surprise they make such an evaluation. Take a look at the front page of The Borneo Bulletin and see if there is any independent reports critical of the Brunei government there. They both read like propaganda journals reporting all the positive things. Hey! If they pay well, I don't mind working as a journalist in Brunei. Media in Brunei are extremely pro-government. The country has been given "Not Free" status by Freedom House; press criticism of the government and monarchy is rare. Nonetheless, the press is not overtly hostile toward alternative viewpoints and is not restricted to publishing only articles regarding the government. The government allowed a printing and publishing company, Brunei Press PLC, to form in 1953. 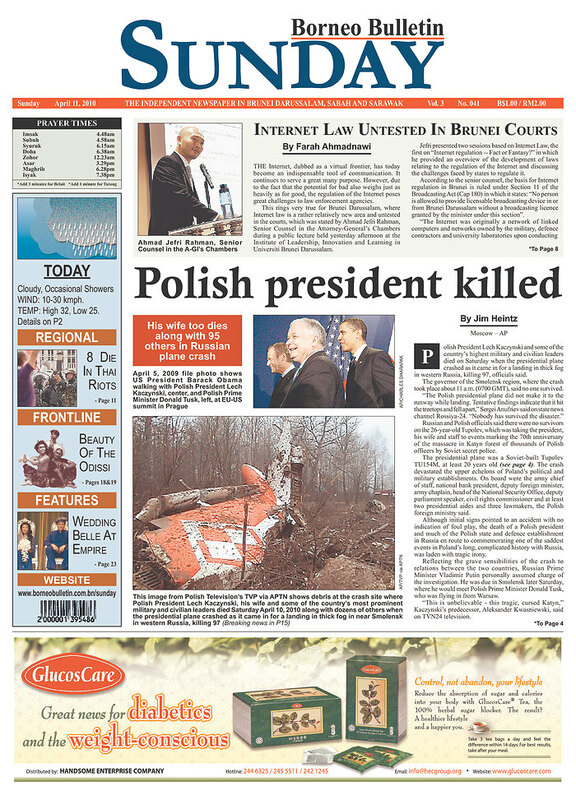 The company continues to print the English daily Borneo Bulletin. This paper began as a weekly community paper and became a daily in 1990 Apart from The Borneo Bulletin, there is also the Media Permata, the local Malay newspaper which is circulated daily. 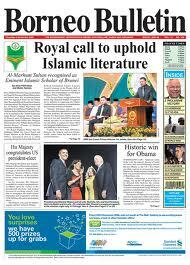 The Brunei Times is another English independent newspaper published in Brunei Darussalam since 2006. You can rest your case. You have caught the RSF with their pants down! Wow! A monster ball! What a way to comment anonymously on the internet? How monstrous is your ball (single testicle?) that you dare not comment about Roketkini, Suara Keadilan, and Harakah also serving their political masters? Ever found a single comment about them criticising their bosses? here starts rocky's style to block some of my responds to make me look like a fool. Everyone knows Rocky is a spin master. how free is free? when you can simply bluff through & through about your saint anwar? hadi? lge? are you not sided to opposition too much also???? care for your free-balls first before accusing loopsideds of the government. haramkah fist circulated without license & only contained 100% pas heavy propagated pas news!! *propagates till now!! no need to write about the rocket! the worst scenario, sinar harian tried its best to 'sound' neutral but nowadays carries more pr's voice rather than rakyats' voice! couldn't believe when i saw front cover reads 'minyak ditemui di kota bharu' as the holyholeshit news to be seen/read/known!! well, it's more like 'you screw me, i screw you back' when comes to newspapers today!! the fact is that, there'll never be a neutral newspaper or journalist at all in this world!! dont want to miss your food, man! "anti bohmau" ...sound so intelligent.